The wild cherries and and the plum trees are in full bloom this week. White, cream and party-pink delights are sprinkled along the roadsides near home. On the forest floor, last season’s leaves feed the soil. I practice different ways of seeing Spring. The camera is part of that – when it surprises me, that too becomes part of seeing with new eyes. Last week I went to a new-to-me public garden and found more Magnolia leaves that were skeletonized by insects; they make wonderful subjects. The one above must not have been tasty. It will disintegrate slowly and elegantly on a bed of dried ferns. Purpleleaf Plum trees line streets with a haze of frothy pink flowers, held aloft by rough, angled branches. The skin of the blossom, smooth and delicate as a baby’s; the skin of the trunk, gnarled and coarse like a grandmother. Plum blossoms are an important symbol in Asian culture, and in particular, in the Zen tradition. The plum tree blooms very early, directly after experiencing harsh, cold conditions. Its simple five-petaled flowers give off a subtle, lovely fragrance. The plum tree has a powerful presence, at once rough, strong, fragile, intimate. Unstoppable. Uncountable branches laden with pale, delicate flowers. Viewed from three stories up, the early Spring woods is a complex web of intersecting lines. moss clings wet and thick. At the garden, a Magnolia leaf eaten by insects slowly disintegrates on a bed of moss. A Purpleleaf plum tree (Prunus cerasifera) near home. The Purpleleaf plum is common in and around Seattle. I thought they were Cherry trees but I just learned that they are a species of plum (in the same genus as cherries, apricots and almonds). This species was introduced to France from Persia well over a hundred years ago, and many different cultivars exist. A row of Purpleleaf plum trees glows like pink and white fizz. Purpleleaf plum flower with stamens full of pollen. The trees have grown into their own forms after years of neglect. Theirs is an untrammeled beauty. A softened and desaturated close-up of the woods – another way to see Spring. A selection of my photographs is available for purchase at lynn-wohlers.pixels.com. This entry was posted in Nature Studies, photography, writing and tagged Plum blossoms, Spring. Bookmark the permalink. There are no photos that I don’t like but I’m especially fond of the slightly soft focus shots. Beautiful! Thank you! They convey the way I see the plum trees. Number Nine! They are all lovely, and your narrative reminds me of your own challenges of this past year… there are times you’ve had to face things with stark realism and inner strength – like in those branches, yet your sensitive and gentle nature is as delicate as one of those lovely blossoms. That photo represents the haziness of the blossoms – we’ve had high winds and rain since then, so at least half of them have fallen now. I’m so gald I am able to get out more often! Your comment brought tears, Lisa. Thank you. ‘tears are the escape vave of the heart.’ – i forget who to credit, but it is surely true.. and if anyone needed that valve to be working well, it’s you. I’m glad you appreciate the writing as well, Adrian, really. The plum trees at this time of year seem perfectly suited for that “clarity and contrast to the left!” processing. Another fine collection of naturally build beauty. Masterfully captured and processed. 🙂 Thanks for commenting – I’m always glad to hear from you. Lovely post, and I really enjoyed your skeletal leaf shots! Great, thanks you, Sue. They’re fun to do. What a beautiful explosion of color! There’s just something about pinks in nature that instantly calm the soul. My goodness, the photographs of the plum blossoms are so beautiful! I’m happy that you enjoyed them Lisa – I’m so glad they didn’t get past me this year. They don’t last long! Bravo! i’m particularly struck by the lacework structure of those skeletonized magnolia leaves — a study in ephemeral beauty, the sort of thing we now see being created for art installations, but never as eleantly, as lyrically, as in nature. Yes, it IS like an installation, but as you say, nature does it more lyrically and elegantly – and I’d say, more simply, too. Spring expresses itself this way, with no effort. Sheer joy! Beautiful textures, composition and atmosphere. 🙂 I’m glad you enjoy these Louis – that’s what makes me happy, bringing some enjoyment through visuals! The 5th and 6th photos, showing the softened trees, are beautiful. I’m especially fond of those shades of green and pink. 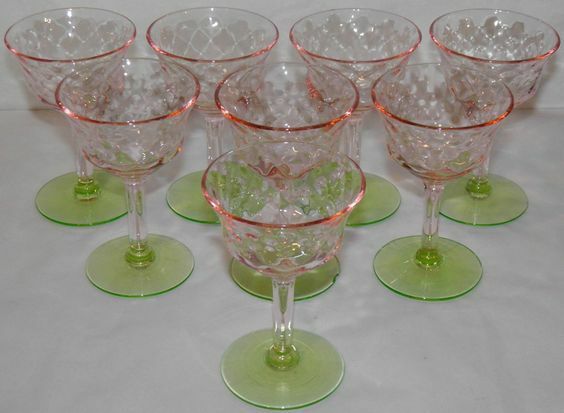 They remind me of my favorite elegant glassware, often called “watermelon glass.” There aren’t many good photos online, but this will give you a sense. The first skeletonized leaf on a bed of green growth looks for all the world like a crocheted tablecloth that has begun to disintegrate with age and use. Thanks for pointing out the particulars, as always – I like the contrast between the blossoms and branches/tree trunks, and up close it’s even better in a way – these trees are covered in lichens, very rough, the perfect foil for those smooth pink petals. And wow, that glass, I love it! The colors are spot on for these colors – exactly the same sort of translucent intensity while still maintaining all the delicacy. Funny comment about the magnolia leaf and moss! Hope you’re having a good weekend! This are all wonderful images, Lynn, but in particular I love the first ones showing close-ups of leaves in various stages of decay. (by the way I haven’t forgotten about seeing you. Will soon get back to you). Those leaves are so photogenic. I always appreciate your comments, Otto. Looks like you’ve been up in the mountains, from Instagram…how nice to go up into the snow and then come down into Spring blossoms. See you soon! With the succession of storms we’ve been having, our azalea flowers blew off before their time. This winter has hung around far too long. I needed those puffs of soft color you provided ever so much. We just had another one – as you did too, I think – and most of the fruit tree blossoms are blowing off. I’m so glad I had the time this year to get out during the week, take my time, and really enjoy them. No more squashing everything into a few hours on the weekend, yes! Oh my god, these are absolutely stunning !!! Nature is so beautiful. All very lovely images Lynn – I especially like the blossom images… ! Thank you, Evelyn – a different color palette than you’re using, but equally lovely, right? I love the way you see, Lynn. Spring is looking beautiful where you are! It is, but I know it will be where you are soon….and you’ll hear all those eastern birds singing that I miss so much – something about growing up with the songs of Cardinals, Wood thrushes, Orioles, Grosbeaks and SO many others that has formed deep connections, that I think I’ll always miss. Susan, I love your comment. That special way of seeing is something you share with Lynn. Isn’t it wonderful to show the world your vision? Both of you are an inspiration. I’m glad you said that – it’s exactly the kind of response I’m most interested in – losing yourself in the image. Thank you Lynn! I know spring invokes color, but your black and whites are particularly powerful. The images draw the viewer to new perspectives. Mmm, good to hear! I like playing with Silver efex pro, it’s quick and flexible. The magnolia leaf seemed to be perfect for that – no need for color there. The last photo looked better when I took almost, but all the color out of it. Thanks! Adore the gentle, delicate touch of your extraordinary and beautiful vision Lyn! Gentle and delicate is the name of the game in earliest Spring, isn’t it? The second shot here is simply glorious! Thanks, Tim, I appreciate your thoughts very much. Great job on them all; top image is my favorite. Thanks John, I am always happy to hear your thoughts. That one was carefully composed! I enjoy seeing your spring, Lynn. The last two photographs are my favorite. And I love the line “The forest is softening,” which those two photographs illustrate. It’s true, isn’t it? I loved the softening of all the deciduous trees along the highways back east every Spring, and that hint of lime green that crept in day by day. Here, so many of the trees lining roads (let’s face it, a lot of what we see is from the car!) are Douglas fir – big, dark, ragged creatures that eat up the light. I’m not real fond of them. . Your keen eye has found the most beautiful elements of nature, Lynn. I love the lacy leaves, the cherry blossom and the dreamier focus and colors of your wider shots. Wonderful post. Thank you so much – I enjoy the very early days of Spring so much. But I will be enjoying it every step of the way! There are so many amazing pictures here, and superb inspiration to make jewelry and woodworking projects, directly from Nature! Thanks for sharing! your photos are SO SO etheral, so beautiful. Thank you !! !